CW system based on willows has been developed as a sewage disposal solution in rural areas in Denmark (Figure 33). Main attributes of the willow wastewater cleaning facilities are that the systems have zero discharge of water (because of evapotranspiration) and part of the nutrients can be recycled via the willow biomass. Furthermore, the harvested biomass may be used as a source of bioenergy. One third of the willows are har vested every year to keep the willows in a young and healthy state with high transpiration rates (Figure 34). The stems of the willows are harvested on a regular basis to stimulate the growth of the willows and to remove some nutrients and heavy metals. The willow wastewater cleaning facilities generally con sist ofapproximately 1.5 m deep high density polyethylene lined basins filled with soil and planted with clones of willow (Salix viminalis L.). The surface area of the systems depends on the amount and quality of the sewage to be treated and the local annual rainfall. The necessary area of the systems is determined by the amount of wastewater, the 'normal' precipitation, and the potential evapotranspiration at the location of the system. For a single household in Denmark the area needed typically is between 120 and 300 m2 with the width of the bed of 8 m. Settled sewage is dispersed underground into the bed under pressure. 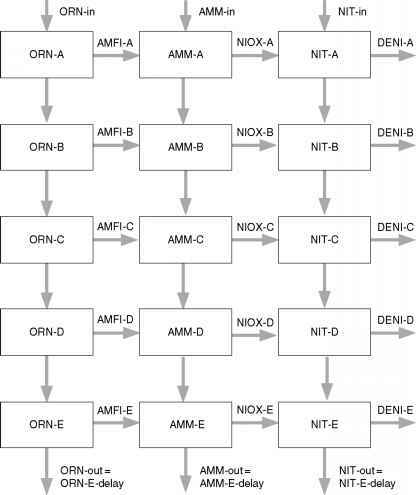 Figure 30 The nitrogen submodel, illustrating the three nitrogen compounds (organic-N, ammonium, and nitrate) (UNEP-IETC). AMFI, oxidation of organic N to ammonium; NIOX, nitrification (ammonium ! nitrate); DENI, denitrification (nitrate ! dinitrogen). evaporative loss of water: high energy input (solar radia tion), high air temperatures, low relative humidity in the air, exchange of air (wind), canopy resistance, stomata resistance, and leaf area index. Due to the clothesline or oasis effects the evapotranspiration from the isolated expanses, on a per unit area basis, may be significantly greater than the calculated potential evapotranspiration. The total annual water loss from the systems is assumed to be 2.5 times the potential evapotranspiration at the location as determined by climatic parameters.